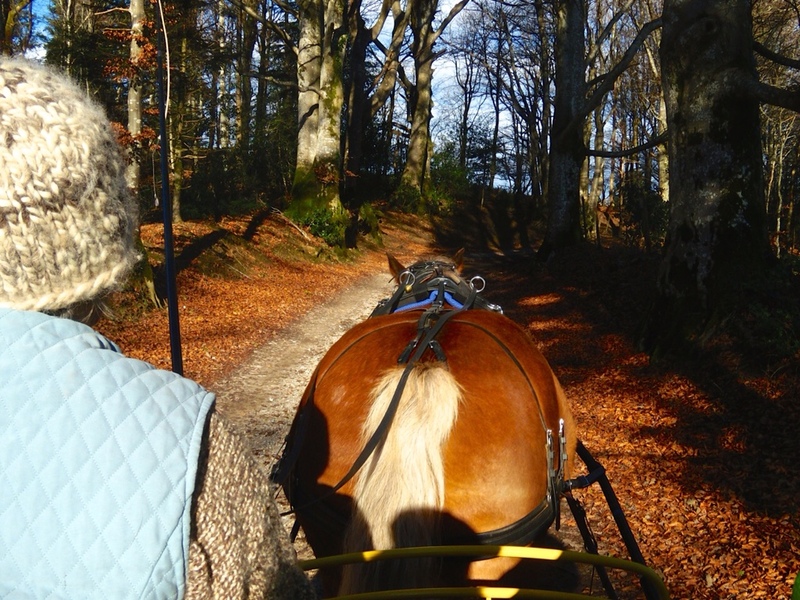 We had a day of sun, bearable temperatures and no wind or rain so we harnessed up Vanille and went for a walk in the forest. Tòti is closed up tight, sleeping in the back garden. Vanille is in her winter coat and resting up for the spring. I’m learning to walk again and resting as well. I feel there is nothing to write about and life seems grey, boring and sleepy. I’m sure many of you feel the same. But look what I found on my morning walk with Bella. When I really opened my eyes I even found the first tulips and daffodils poking through the soggy earth. 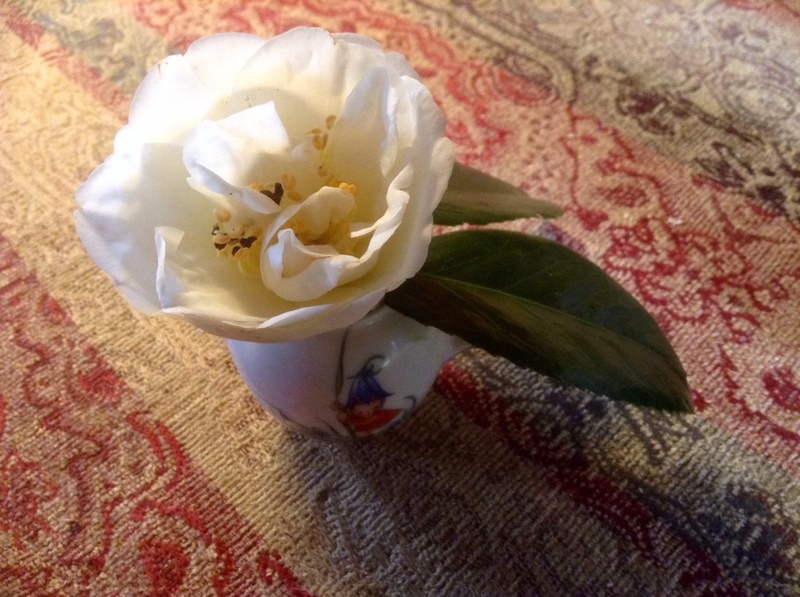 This delicate flower was one of the first to open on the Camelia bush that is tucked away at the bottom of the garden. There it is, the promise of spring after all! I have spent hours on my iPad this winter. Although I’m not a fan of modern devices I have come to love this little device. It has opened the door to an unknown world for me and helped the days of convalescence pass faster. I now follow four FB groups: Aging Horsewomen, Horse Human Bond, Competitive Bitless Dressage, and I Love Comtois Horses UK. Through these groups I have met several amazing women who have spent precious time answering my questions and offering me valuable information. 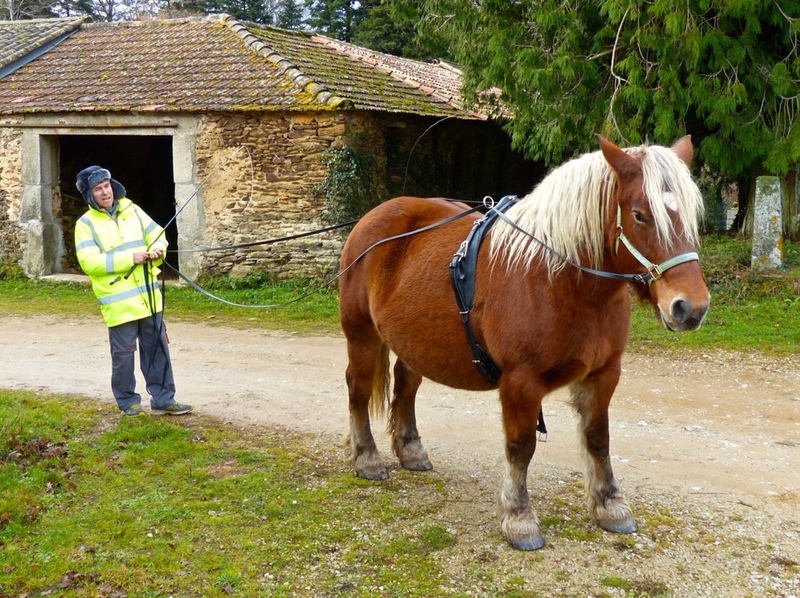 There is an international movement towards another way of communicating with horses, and riding or driving without a bit and without iron shoes on the horse. The traditional methods are being examined and challenged. The videos of scientific research into the effects of the bit and iron shoes on the horse are proof that we must find a better way if we care about our horses. There are numerous videos of talented riders competing over jumps and in dressage both western and english with bitless bridles, neck rope control and many without saddles. I can only imagine the hours and hours of patient work that makes this possible. The information is endless and incredibly inspiring. My news feed is filled with stories of therapy horses, rescue organizations, and people who take horses from killpens and successfully trailride and compete with them, people who are able to leave their wheelchairs and ride, women with numerous knee replacements, back surgery and hip replacements who continue to ride, and children in need who find hope and strength working with horses. There is much much more! It gives me such hope in humankind. If you are interested, search the internet. I’m 76 this year and I doubt I will ever ride again but I’m thrilled to see these changes. Isolated as I am I would know nothing of this without the hours I’ve spent on the internet and I would never have spent these hours on the internet if I had not been recovering from yet another knee replacement. There is something positive in everything that happens I suppose. In the midst of my obsession with the iPad, I am starting to walk. I bought hiking poles and they are a confidence builder. I can take care of Vanille now, and Bella and I go for our morning walk together, further and further each day. The iPad is becoming a bit lonely. Today the sun is shining. My spirits are lifting after weeks of grey, rain, wind and fog. I will give Vanille a good brushing and spend the afternoon with her. I’m making plans for the spring. Warmer weather will find me long reining Vanille bitless and I hope to buy a Zilco flower hackamore to help. I also plan to do some neck rope control ground work thanks to information from a wonderful new friend in Australia. Please don’t think for a minute that you or I can change from riding or driving with a bit to going bitless in a moment. It takes study and work to change. Some will not want to bother but others will succeed and this is absolutely amazing. There is a woman with lovely Arabian horses living near us. She offers trail rides and her horses are barefoot and bitless. We have a friend who has been riding for 2 years and his daughter rides as well. He changed to bitless quite fast with his horse. For some of us it is difficult to change our ideas, those ideas we’ve had forever, but it’s possible. When we see the damage bits can do, we must at least give it some thought. The FB group Competitive Bitless Dressage has lots of interesting information. The Tulips and Daffodils are reaching for the sun and the Camelia bush is bursting into bloom. As always a reminder that spring, warmth and light are just around the corner. The last months have been painful but I realize that my days on the sofa with ice on my knee have not been wasted and we will soon be enjoying the sun again. My energy and hope in the future are awakening with the Camelia blooms. I love this photo! Jean François heading down our lane with Vanille in just a halter. He took her out twice this way and she was perfect. She hates her bit. When I show her bridle to her, she lifts up her lip and it quivers. Afterwards she takes the bit gently and willingly but she has let me know that she doesn’t like it. This entry was posted in Art, attelage, barefoot draft horse, Community, Comtois horse, Gypsy wagon decoration, Gypsy wagon/Roulotte construction technique, Horse drawn vehicles, Lifestyle, Roulotte, Small living spaces and tagged Art, attelage, barefoot draft horse, building a gypsy caravan, Comtois horse, Creative living, France, gypsy caravan, Gypsy wagon, Horse lovers, Lifestyle, Light draft horses, Roulotte, Scale model of a roulotte, Small living spaces. Bookmark the permalink.